I got up early this morning to get ready for my wife and I to return home from Virginia after bringing our oldest son up to Liberty for his freshman year. I was playing around on the computer when I thought about it being a while since I have put anything on my blog. To my surprise I logged on to find out the last entry was the trip to Liberty for CFAW. It is amazing to think back since that blog and realize the blessings, love, and mercy of God on our lives. I am looking forward to great things from him and know that God has a plan for his life. Today will be hard as we leave him behind with his new life but I am excited about his future and his willingness to follow the Lord! Today I am a man without a job. Not permanently- but it’s a weird feeling. Yesterday was my last day at a job I have been blessed to have for the last 8 years. I have met great people and had an excellent boss. The Lord opened the doors for me to return with my family to my hometown of Southwest GA and a wonderful job opportunity there. I will miss my family and friends here in Nebraska, but so look forward to new challenges that await back home. Our life has gotten so hectic over the last year that I have been unable to really focus on my Biblical training or just life in general. I look forward to new opportunities and returning to a church home where sound fundamental Bible preaching exists without the ever present ecumenical push by Pastors unwilling to stand strong on God’s Word and a clear cut plan of Salvation. No – we are not all the same, No – we are not all in some pie in the sky church if we just “believe in God”, No – we are not all God’s children and just have different ways we come to Him. My Bible plainly states by my Father that the ONLY way to Him is through His Son Jesus Christ and through the process of recognizing I am a sinner, asking for His forgiveness, turning from that sin, and asking His Son to be my Lord, Savior, and Propitiation for that sin and stand in my place! It is not based on anything I have done, can do, or will do in the future to merit or to retain that Salvation. As I see our Country continue to unravel and decline in moral and spiritual matters, I am saddened to know that we are most likely seeing a nation who is coming under judgment by a Holy God. While it is so easy to get upset about Satan and his crowd ruining the spiritual fabric of this nation, I think we must realize that sadly much of this problem can be traced back to the spiritual cancer and decay within the walls of what once were fundamental Bible preaching and believing churches and institutions. A revival of God’s people is greatly needed throughout the land if we would desire to once again see homes, churches, communities, and country following the old path and standing on God’s Word. Until then, each one of us has the responsibility to do our part to lead our families in the way that pleases the Lord and seeks to fulfill His will in our own lives. It was a great day today- plenty of sunshine and great for riding. We went through Keystone and up to Mount Rushmore, which was a really unique place to visit. I read in an article that about 90% of all the carving in the monument was done with dynamite. That is amazing! From there, we went over and hit the Needles Highway and spent most of the day there, driving through the parks and seeing the majestic beauty of God’s creation. I got sunburned… again….. but it was a great day! Dad wanted to see the buffalo and there were plenty to see in a pasture on the wildlife loop. A long day for sure but full of great times and memories! 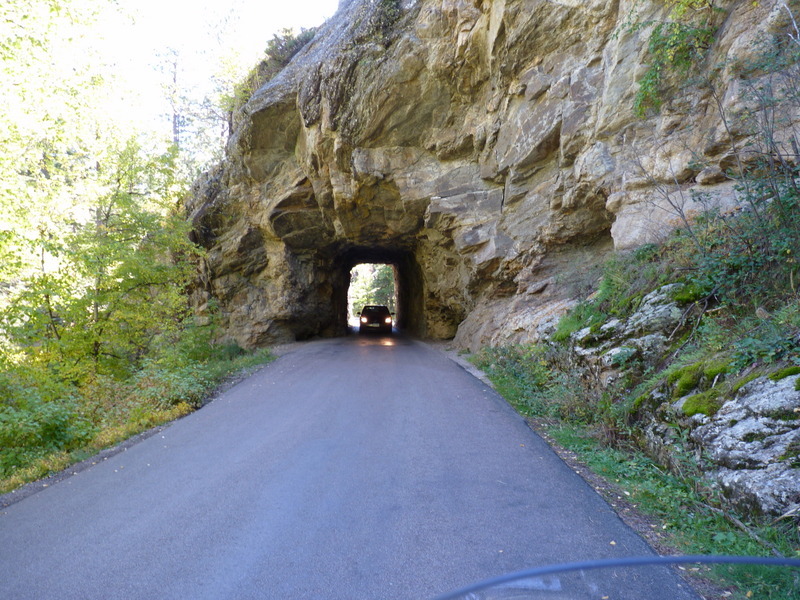 This is a picture of one of the tunnels on the Needles Highway. After a long afternoon of cold and misty weather, we woke up this morning to bright sunny skies and no clouds! We are heading out to Mt. Rushmore today and on to the Needles Highway so we should have some great pictures soon. It was in the upper 30’s this morning, but it is expected to be lower 60’s for the high today, so a great day to ride! After a couple of years of waiting, my dad and I are finally able to take our father/son bike trip! We had originally planned on going out to Laramie, WY but the weather pushed up to make some changes. We decided to go up to Rapid City, SD and arrived here last night. Our 6 hour trip turned out to be closer to 9 with the addition of lunch and scenery breaks but it was a great trip. We went the back roads through the parks and passed through several small towns including Hot Springs, SD. There are many beautiful towns here on the route and they have so many different things to do. This morning, we are sitting in the hotel as the weather today is 50% chance of rain and in the 40’s for the high. Tomorrow and Sunday’s forecasts are beautiful, so today will be a good day to rest and visit Cabelas next door! Loaded up and ready to roll out to South Dakota (9-26-13).